LONDON KY—On Sunday, March 5th London Police Sgt. Randy Medlock conducted a traffic stop on a 2010 Nissan Rogue for driving over the speed limit on Old Whitley road. During the stop it was determined the driver, Sherri Baker, 41, of Winding Blade Road in East Bernstadt was driving under the influence. A series of field sobriety tests concluded that she was manifestly under the influence. She was arrested by Ofc. Jacob Bormann and charged with operating a motor vehicle under the influence of alcohol/drugs, speeding, failure to produce insurance and one headlight. 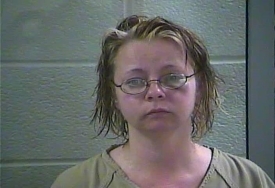 She was also arrested on a Laurel County bench warrant for failure to appear. She was lodged in the Laurel County Detention Center. through the London-Laurel Co. Dispatch Center regarding someone in the woods behind Baymont Inn on KY-192. A wanted female in violation of parole was located in the Inn’s parking lot and was arrested and charged with possession of a controlled substance. The female was identified as Antonia S. Bowling, 29, of Manchester. She had warrants for failure to appear in court and fines out of Whitley and Clay Counties. Through a search, officers discovered that she had methamphetamine in a small change purse attached to her wrist. Also located in a baggy within the purse was a Tramadol 50mg pill. Ofc. Jacob Bormann arrested Bowling and charged her with first-degree possession of a controlled substance and third-degree possession of a controlled substance. Assisting with the investigation and arrest was Sgt. Randy Medlock and Sgt. Eric Wilkerson. Bowling was lodged in the Laurel County Detention Center.